A unique multieffect plugin that merges its three processors into a single cohesive tool with style and ingenuity. Incredible sound mangling. Great for subtler processing, too. Awesome modulation system. Diverse preset library. Slightly confusing GUI. Modulation section is cramped. Three LFOs could be rolled into one. 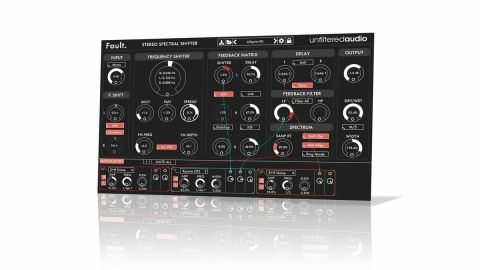 Billed as a "stereo spectral shifter" and "a new kind of effect", Fault (VST/AU/AAX) is a plugin effect with three discrete processors at its heart, all of them manipulated independently for the left and right channels, or linked. The first section is the Pitch Shifter, which simply pitches left, right or both channels up and/or down by up to an octave, in 0.1 semitone steps, or semitone steps if the Quantize button is activated. Next, the Frequency Shifter consists of a main knob for setting the Base shift amount up to +/-500Hz and a pair of associated controls for modifying it: Multiply scales the Base frequency by 0.0x to 10x in 0.1x steps, while Spread multiplies the left channel by the right channel from -1.0x to 1.0x, again in 0.1x steps. Thus, the full range of the frequency shifter becomes +/-5kHz, and the right channel can be offset from the left channel pretty much freely. The Base, Left and Right frequencies are shown in the middle of the main knob. Although all the Frequency Shifter's controls are available as targets for Fault's modulation sources, the section also incorporates its own frequency modulation oscillator, for adding that characteristic metallic FM 'ring' to the sound. The FM Frequency ranges from 0x to 10x (in 0.1x steps), as does the FM Depth knob. There's also a button for switching between linear and exponential FM algorithms. The third processing stage is the Delay section, with separate (but linkable) delay lines for the left and right channels, and delay times of 5-2000ms in unsynced mode and 1 bar to 1/64T synced. With its combination of channel-independent pitchshifting, frequency shifting and delay, Fault is already pretty unusual, but the Feedback matrix really brings it all together, with separate feedback paths for the pitch-/frequency-shifted signal and the delayed signal, each with independent left and right level controls, and adjustable L/R cross-feedback. Cranking up the Shifter feedback introduces buzz, burble and aggression, while Delay feedback, of course, extends and smears the delays in time. Low- and high-pass filters in the feedback path provide tonal darkening and brightening, and the Stabilize switch keeps the feedback from getting out of control - disable it and Fault can actually 'self-oscillate' without input. Finally, the Spectrum and Output sections house controls for lowering the sample rate throughout the plugin (with subsequent altering of frequency shift and unsynced delay times), soft clipping, anti-aliasing (for clearer downward frequency shifting through suppression of low harmonic 'bounce'), mid/side processing and stereo width adjustment. There's also a Ring Mode, for turning the shifters into ring modulators, opening up further textural possibilities. Key to getting the most out of Fault is its nifty modulation system, which Unfiltered Audio have clearly put a lot of effort into. Up to six Modulators are added in the pop-out bottom panel and each one can be set to one of six types. The first three are Saw/Triangle, Sine and Square LFOs, and the remaining types comprise an envelope follower, a Sample and Hold Noise generator, and a Macro knob. To assign a modulator to a target parameter, drag a 'cable' from the former's output to the latter's mod input and adjust the output depth knob. Each output can feed multiple inputs, modulators can modulate each other, and there's no limit to the number of outputs you can take from any given modulator (although you can't collapse them, so things can get quite 'scrolly'). Full visual feedback is given for every modulation, too, we're pleased to see. It's a brilliant, intuitive system and one that greatly rewards experimentation. The range of effects that Fault can pull off is enormous. It specialises in overtly creative processing, from extreme, highly animated, metalised mangling of frequency, time and spread, but it's also very useful as a functional/ corrective mixing tool, bringing instruments to the fore or repositioning them in stereo space via gentle modulation and feedback filtering. Particularly effective on drums, synths, vocals and other frequency-rich signals, Fault is, ironically, almost faultless, the high asking price being the only significant issue.